I am very late in posting my Runway Inspired Challenge #81. I was away for Easter Holidays and had really bad internet connection.So could not write and publish my post. I am back now and here is my take on Runway Inspired Challenge #81 – Jeremy Scott. What inspired me most in the photo was the colourful squares! 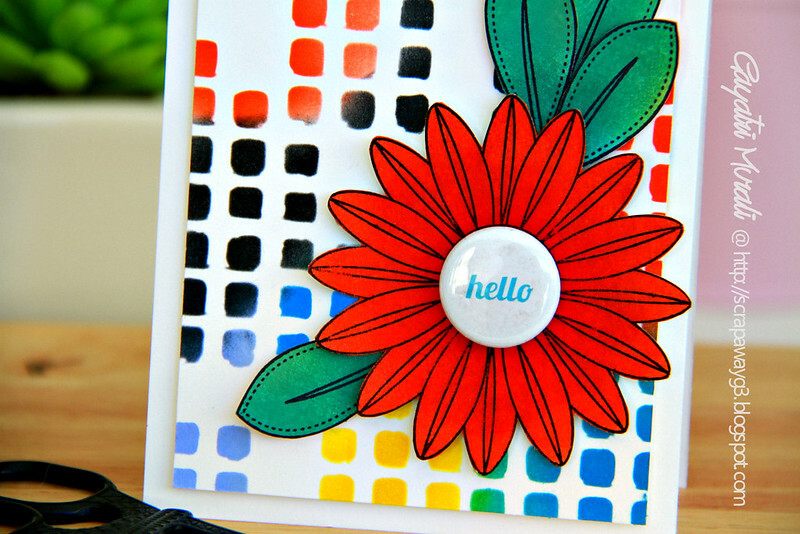 I tried to recreate the squares on my card using Prima Marketing stencil. Here is my take on the challenge. I sponged the distress inks in colours from the Jeremy Scott outfit on the card panel as my background.Then I picked the brightest colours from outfit to colour the flowers and leaves. The flower and leaves are Botanical Love stamp set from Create A Smile. I love this set for the beautiful flowers. I fuzzy cut the flower and leaves and adhered on the panel using foam adhesives. For the sentiment, I have used Bossy Joscie’s Hello Flair. I adhered this flair as the centre of the flower. Check out Runway Inspired Challenge Blog for more design team inspiration and come and play along the challenge. Welcome home Gayatri. Your card is simply stunning.